Our apartment is 57sqm large in a detached house with 3000sqm floor space in a cul-de-sac at the edge of the forest. The renovation was completed in April 2017. The entrance is separate, you come through the pantry kitchen into the living room. The bathroom has a barrier-free shower and a handicapped accessible toilet. It has a floor heating. From the bathroom window looks directly into the forest. The bedroom is equipped with 2 new photo beds 90 x 200, mattresses a closet and an antique desk / chair. Hypoallergenic, is laid in the Schlaf.- and living room laminate. The living room has an LCD TV, free Wi-Fi, a sofa bed and a dining area for 3 pers .. From the living room leads directly to the private terrace with balcony furniture and a beach chair. The terrace is from the south side of the house, so the sun all day with a view of the Gehrdener Berg and the Deister. The bathroom is equipped with underfloor heating a Led motion detector. the shower is at ground level with 1 cm difference in height. For hygienic reasons, we have chosen a glass wall and a shower curtain. Additionally there is a shared guest toilet. With us you live at the FOREST far away from the stress zone. Everything is possible here is in 17 minutes in Hanover 20 minutes at the fair or 30 seconds in the woods. Motorcyclists are 1 hour from the Harz or 30 minutes from the Weserbergland a wonderful change. Montain bikers can start right outside the front door, here with some obstacles. For hikers it goes directly to the Benther Berg. The playground can be reached on foot in 7 minutes. In 5 minutes walk you can reach a pizzeria, 15 minutes walk to a German and a Greek restaurant and a cafe. 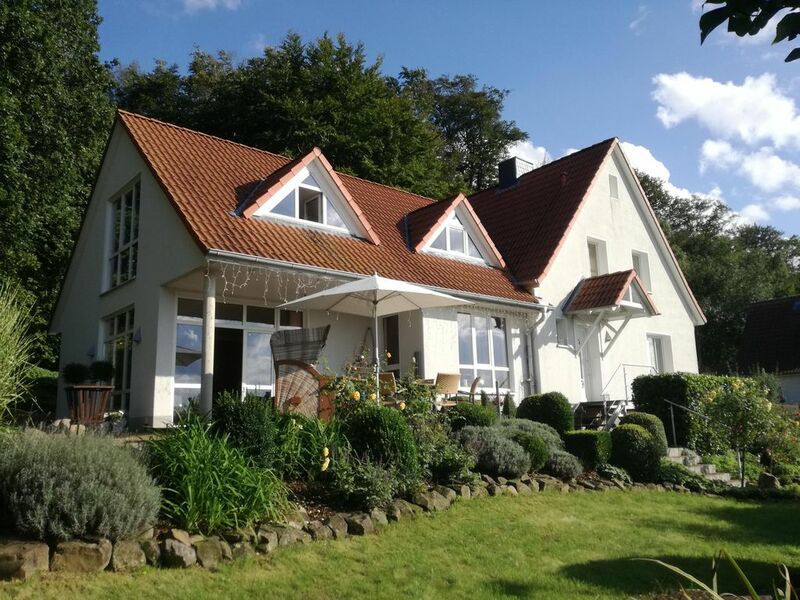 We live directly at the forest, from here you can wonderfully right outside the door with the mountain bike in the Deister drive, jog and go for a walk.